*Update: May 29* There’s an old trader tip that says “buy when it snows and sell when it goes.” Now, it wasn’t too long ago that the snow actually did leave but the arrival of May “should” mean no more snow. Alas, snow wasn’t the only thing disappearing to kick off this month. Several Canadian discount brokerages decided to hang up their promotional skates (for the moment anyway) which has certainly cleared the field for those brokerages actively promoting offers, to continue to post offers to win over new clients and assets. Yes, the big story heading into the new month isn’t who arrived but rather who stepped back. As of the beginning of May, HSBC InvestDirect, National Bank Direct Brokerage and Virtual Brokers all let the clocks on their respective offers run out. For DIY investors seeking out cash-back promotions, the field is slim, with either Questrade (via their referral offer) or BMO InvestorLine (whose offer also comes with free trades) providing easy to access cash back offers. Scotia iTRADE and BMO InvestorLine also offer referral promotions with a cash-back component to them however accessing these offers requires more effort that either Questrade’s referral-based cash-back offer or BMO’s standard offer. Side note, BMO InvestorLine’s referral offer can be combined with their current commission-free trading + cash back offer. It will be interesting to see just how long competitor online brokerages to BMO InvestorLine and Questrade are willing to sit on the sidelines while both firms dominate the deals field unchallenged (at least for now). For the moment, however, the stats are clear: for DIY investors looking for a deal are going to focusing hard on the only brokerages in the spotlight at this point. 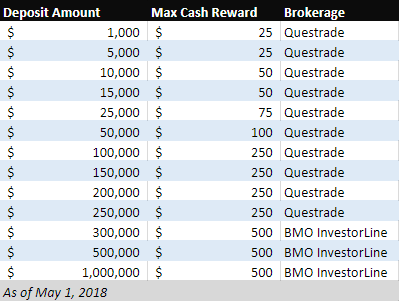 Correction: an earlier version of the table that referenced a cash reward of $400 at Questrade for a deposit of $250,000 was incorrect. The current table has been updated with correct information. Several offers from Canadian online brokerages expired at the end of April. Virtual Brokers’ transfer fee technically expired, while National Bank Direct Brokerage’s commission-free trading promotion also expired. HSBC InvestDirect’s cash back promotion officially ended after having been extended just a little while longer. No offers were extended as of the beginning of May. *Update May 29 – After an interesting little blip in the deals section, National Bank Direct Brokerage is back once again with their commission-free trade offer. The deal, which is interestingly not posted on their promotions section or in their header slider, is being advertised (and was discovered) on Facebook. In any case, there is a live link to the offer that we’ve included in the table below. This new offer is similar previous commission-free trade deal of 25 trades which are good for one year except there is also promotional pricing of $6.95 per trade when the 25 trades are used up. This is actually quite a compelling offer for anyone interested in trying out NBDB because they are lowering their standard commission pricing down from $9.95 to where CIBC Investor’s Edge pricing is on a standard basis. So, although this discounted pricing is temporary, it definitely means National Bank Direct Brokerage has one of the most competitive offers out there. No new offers to announce at the outset of May.